This is one of my very favourite recipes. It is so simple, so tasty and so good for you that it is impossible to mess up. It is also one of those recipes that does double duty – perfect as a side dish, outstanding as a meal on it’s own, even better paired with a piece of grilled chicken or salmon. Wait, that is a triple play, not a double. You get the idea though. 1 (10 ounce) bag of fresh baby spinach, washed and dried. Heat the olive oil in a skillet over medium-low heat. Cook the garlic and onion in the oil until translucent, about 5 minutes. Stir in the spinach, garbanzo beans, cumin, and salt. Allow to cook until thoroughly heated and spinach is wilted. Makes 4 Servings as a side dish, 2 for a main dish. 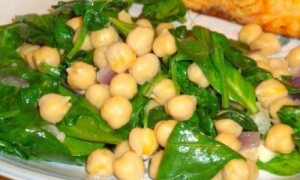 * Chickpeas (Garbanzos) can also be re-hydrated from dry (much better for you than canned, no added sodium). Just soak beans in cold water overnight. Drain, place in a pot and cover with fresh, cold water. Bring to a boil, cover and simmer for about 60 minutes or until tender. Drain, rinse and use as you would canned beans. They also freeze beautifully after cooking. Just place in an air-tight container and pop in the freezer for when you need some that are already cooked.